Seoul, May 18, 2015 – Alibaba Group Holding Limited (NYSE: BABA) today announced the launch of the Korea Pavilion (http://korea.tmall.com) on Tmall.com, China’s largest third-party B2C platform for brands and retailers. The Korea Pavilion is the first official online country pavilion dedicated to providing consumers in China with one-stop shop for genuine Korean products and travel and cultural information. 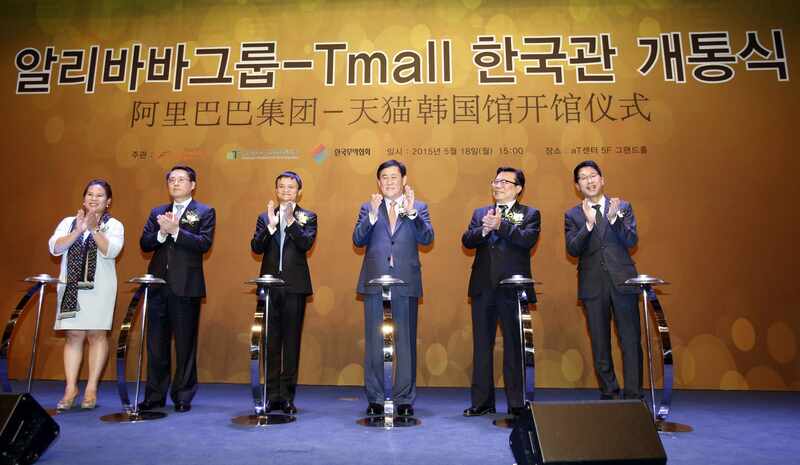 Jack Ma, Founder and Executive Chairman of Alibaba Group and Choi Kyunghwan, Deputy Prime Minister of Korea unveiled Tmall.com’s Korea Pavilion in a ceremony at the aT Center. Tmall.com’s Korea Pavilion is the result of fruitful discussions between Alibaba Group and the Korean government over the past year. These discussions have yielded other positive initiatives such as collaboration in logistics and the creation of internship programs aimed at increasing the cooperation between Chinese and Korean enterprises. To further strengthen the collaboration between Chinese and Korean companies, Alibaba Group is working with KITA to initiate a youth internship program that will let 100 Korean college graduates intern at Alibaba Group’s headquarters in Hangzhou. The first session of the three-month long internship program will start in early July. The selected interns will learn about the Chinese consumer market, its characteristics, and the operations and business of Alibaba Group’s e-commerce platforms. Through this internship, Korean college graduates can learn about the rapidly growing Chinese market and bring that experience and knowledge back to South Korea. With the growing demand of Korean products among Chinese consumers, Cainiao, the logistics affiliate of Alibaba Group, is looking to expand its partnerships with Korean companies to bring the best cross-border logistics solutions possible to the Chinese consumers. Following the meetings between Jack Ma and various Korean government officials in January 2015 and earlier in 2014, Alibaba Group has been dedicated into helping Korean SMEs and bridging the Chinese-Korean culture to bring a closer connection between Chinese shoppers and Korean merchants through various projects and initiatives.